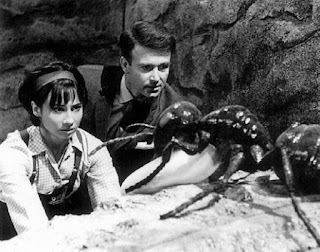 The Angriest: Doctor Who: "Planet of Giants"
It is 31 October 1964, and time for the second series premiere of Doctor Who. At last the Doctor (William Hartnell) returns to 1960s London - with one major hitch. A fault causes the TARDIS doors to open during its landing procedure, causing the ship and its inhabitants to shrink down to less than one inch in height. When Ian (William Russell) is separated from the others, he discovered a murdered body - the result of a callous businessman killing a government inspector. When Doctor Who was originally conceived, one of the potential storylines that continually got cited in proposal documents was "The Giants", in which the Doctor and his companions would be shrunk down to minuscule proportions, so that everyday household objects would suddenly become terrifying threats. It took a year for the concept to finally reach the screen, but it was honestly worth the wait. This is a wonderfully entertaining episode, presenting a wholesome kind of child-friendly entertainment. There is simply a huge amount of fun watching the Doctor and his friends wander around strange geometric canyons - actually the gaps between paving stones - and stumbling onto enormous earthworms and giant ants. All of the creatures are dead, which gives the episode an eerie mystery to solve and a nice sense of menace. It is also very impressively presented, with effective sets and props even if the sense of scale seems a little uneven. A lot of time is spent in the episode's first half attempting to find out just what has occurred during the TARDIS landing. The scanner screen implodes when the Doctor attempts to turn it on, but when he exits the vehicle everything outside seems relatively normal. The strange canyon walls are intriguing, and the character debate what sort of a world could contain such enormous insect life. Even when Ian stumbles upon a discarded matchbox his first assumption is that it is some sort of sculptural theme park. The realisation that the entire TARDIS crew has been shrunk is a well-played one. If the episode has a weak point, it is the full-scale story being told far above them. A business investor named Forrester (Alan Tilvern) is paying for the development of a new insecticide, but the government inspector (Frank Crawshaw) sent to assess its environmental risk refuses to approve its release. Rather than give up or work on redeveloping his insecticide, Forrester instead chooses to shoot the inspector stone dead. It's a weak and somewhat silly motivation that makes the whole plotline difficult to swallow: Forrester's reaction outweighs his situation by such a degree that it becomes somewhat farcical. Nonetheless, the scenes of the Doctor, Ian, Barbara and Susan exploring their minuscule world more than make up for the Forrester storyline. This is a wonderfully fun half hour that sets Series 2 off on an entertaining note.